Jesus’ words are clear: “in this world you will have trouble” (John 16:33). Often, harder than facing our own troubles is watching those we love struggle. We don’t always know how to help. When Lazarus died and his sisters mourned, Jesus wept. Standing with His friends, mourning their shared loss, Jesus knew He was going to raise Lazarus from the dead. He knew His friend wouldn’t be in the ground forever. Yet Jesus, fully man and fully God, grieved with them (John 11). So often our first reaction when we witness pain is to want it to end immediately. Rather than experience natural, God-created emotions, we want to skip to what we’re comfortable with. We’d prefer to point to how it’s going to be okay or to put it in perspective. Yet, as the passage in Romans 12 states, we are also to weep with those weep. Like Jesus, even as we know that God has a sovereign plan to work all things for good, we sometimes need to wait on the “fix”. We are, instead, to experience sorrow and other emotions alongside others. There is a time for all things, as Ecclesiastes 3 says, including feeling what is only natural to feel. At such an emotional time (Jesus sweat blood in anguish!) Jesus desired to have loved ones nearby. They were simply to keep watch, waiting while He prayed and wrestled with the Lord. The Greek word for “keep watch,” which is transliterated “grégoreó,” literally means “stay awake”. Jesus wanted His friends to be awake with Him in the difficult hour. Many of us have friends whose troubles have them spending sleepless nights and lonesome days wrestling with God and crying out to Him. What a simple task it is to simply be there, and be aware. The disciples weren’t asked to intervene or intercede. They couldn’t possibly know all the turmoil in Jesus’ soul. But they could stay near. We can too. There is a time for comfort. Just as much as we need to share each other’s burdens, we also must build each other in hope. 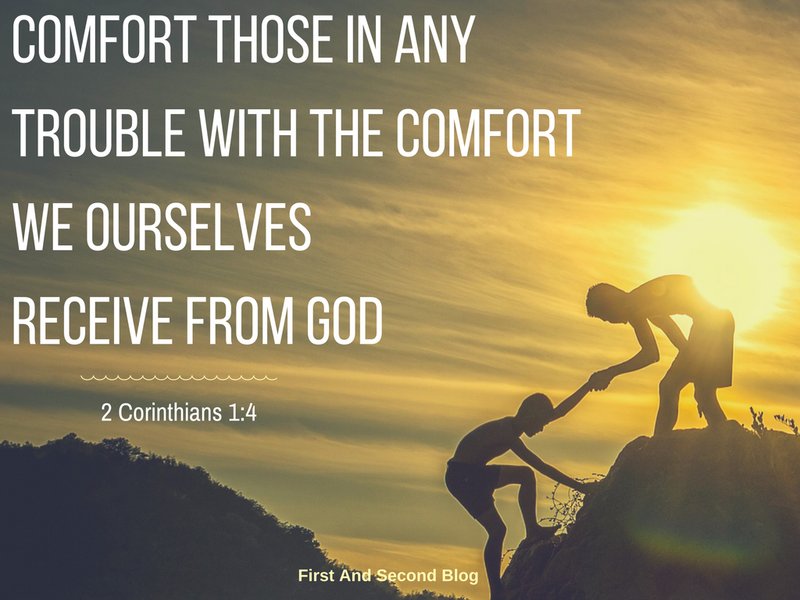 Paul alludes to our hope –our comfort- in 2 Corinthians 1. He explains: through the experiences we simply cannot bear ourselves, we learn to rely on God. Our God is our comfort and our hope. He is also our comforter. No words we can come up with is as comforting as the truth of the Lord. Suggestions that everything will be okay, or that it will get better in time, are words spoken without full assurance. Plenty of things aren’t okay and don’t get better in this world. Yet we have comfort to offer, and it is what (who) God gives us: His only son. In times of trouble, our hope is secure. Our God is unchanging. Jesus saves us. Nothing can separate us from His love. He works all things together for good according to His purposes. He is perfect. Christ is sufficient, His power made perfect in our weakness (2 Corinthians 12:9). This is the comfort we receive, even as He identifies with our sufferings. Pointing to Him is the best comfort we can give. Next PostDon’t Spoil the Surprise! Thank you for sharing this post, Bethany! What a wonderful reminder that we are human, and in our creation we were designed to feel with each other and bear our most authentic emotions with each other, and not rush past to experience only the comfortable feelings. This a great reminder that we are here to pick each other up, but we are also here to share our tears with one another in empathy. Beautiful. Thank you and God bless! Thank you Lance! I’m so grateful God teaches us how to be godly in loving each other as human beings, even in the hardest times. Thank you for sharing this, Bethany! Living in this fallen, broken world means that we and others have to go through trials and hard times. It’s so good to recognize that in His Word, God gives us ways to sit with those who are hurting. That is so important. God bless you! True, Ronja! I’m thankful God is clear about hardship and about helping others through it. I know He uses you to comfort many in your line of work : ) God bless you too! So beautiful, Bethany. It took me a lot of years to learn how to respond like this (still learning, actually). These three responses are so much more helpful and comforting than trying to “fix it” or (worse) pretending the situation doesn’t exist. Thank you Lois, I’m absolutely still learning this too. Being a doer, “fix it” is my tendency, but God’s Word shows another (better!) way!